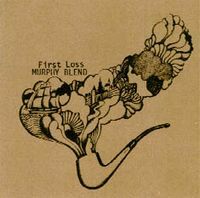 Murphy Blend was a German formation from the early Seventies, the name is derived from writer Samuel Beckett his novel Murphy from 1938. The album title from their debut LP is the English translation from the famous piece Erster Verlust by German Robert Schumann, a legendary composer from the Romantic era. The focus on First Loss is on the mighty Hammond organ, from moaning and groaning to bombastic waves and swirling runs, in its full splendor. The music strongly evokes late Sixties and early Seventies bands like Vanilla Fudge, Uriah Heep (the track Past Has Gone sounds like a tribute to Ken Hensley) and Deep Purple. All bands that feature powerful interplay between the Hammond and electric guitar, fuelled by an often dynamic and propulsive rhythm-section, especially in At First en Speed Is Coming Back. The seven tracks (in fact six because the final one Happiness only lasts 6 seconds) alternate between fluent up-tempo songs to compelling bluesrock (the vocals in Pradudium/Use Your Feet are close to Steve Winwood). And frequently we can enjoy a 'churchy' Hammond organ sound, this evokes a strong classical climate, in the track Funny Guys even Toccata In D-Fuga is blended. In Past Has Gone (beautiful Hammond intermezzo with romantic and classical undertones) the German 'bluesrock prog' from Jane comes to my mind, also due to the melancholical vocals and the Hammond and guitar interplay. The most dynamic and varied composition is the long titletrack that contains lots of changes in atmosphere and tempo, tastefully coloured with Hammond and guitar, from psychedelic and classical to pure rock and roll! To me this reissue sounds as a very pleasant Hammond drenched album, tastefully arranged, and a strong variety in the genuine progressive rock tradition.